One of the great pleasures of blogging is that you get to share books and thoughts with others. Ideally the blogger not only enjoys writing about a subject that interests them, but others learn from, enjoy, or are inspired by their posts. I haven’t progressed very far in my chosen reading challenges yet, but I have been inspired by other people’s blogs, and by books that I have discovered through these challenges. While scrolling through other January reviews at the Year of the Historical Reading Challenge, I found a series of mysteries featuring playwright Oscar Wilde as a sleuth. Earlier that month I had become intrigued by the Historical Novel Society’s review of an Abigail Adams mystery. Much to my surprise, there are a number of mysteries that recast famous historical figures in the role of amateur detective. 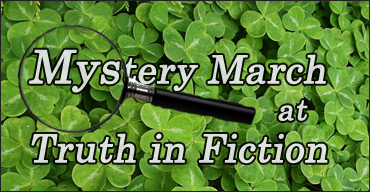 Finding it hard to pass up the alliteration, an idea was born for “Mystery March”, a month of mystery and history. Throughout March I’ll be taking a look at some of these historical mysteries and their famous detectives. Having signed up for the fabulous Ireland Reading Challenge over at Books and Movies, I’ve also decided that March is the perfect month to jump in and explore Irish history. Although I’ve always had an interest in history, it was a wonderful professor and a course on Irish history that really sparked my passion, so Irish history holds a special place in my heart. Over the course of the month I’ll be reading and reviewing some Irish fiction and non-fiction and sharing interesting tidbits on the history of the Emerald Isle. I’ll also be introducing a new feature called “The Historical Tourist”, in which I’ll take a look at the history behind some of the tourist attractions I’ve been fortunate enough to visit. I look forward to sharing my interest in Irish history with you! Cool idea for March- I look forward to your posts! Wow, it sounds as though you’ll be very busy this month! I’m looking forward to all three themes of your upcoming posts. The Historical Tourist feature has tremendous potential.